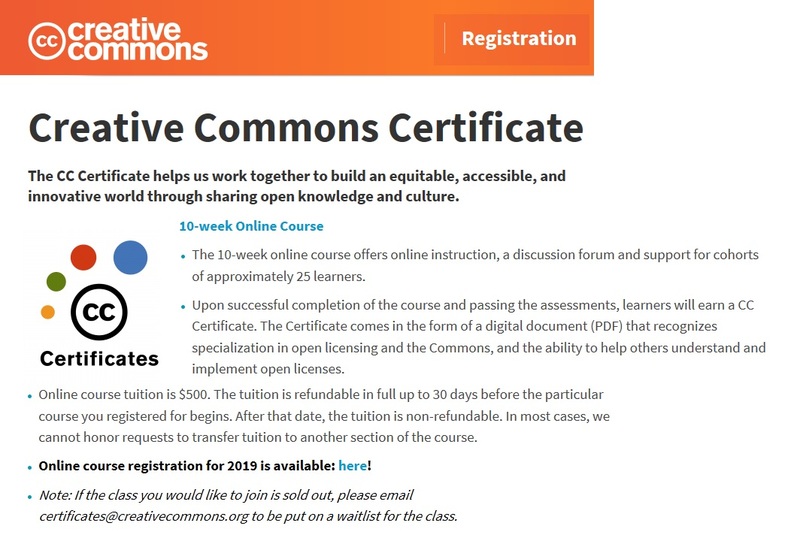 The Creative Commons (CC) Certificate is an in-depth course about CC licenses, open practices and the ethos of the Commons. CC plans on adding new fields of practice, launching a certificate instructor training program, and funding a CC Certificate scholarship program. meet open licensing requirements increasingly present in government and foundation grants and contracts. The CC Certificate Facilitator Training will develop a growing network of qualified professionals who can expertly instruct future classes, and help us meet the need for more Certificate classes. The course is composed of readings, quizzes, discussions, and practical exercises to develop learners’ open skills. This course is open to everyone, from university students and entry-level professionals to experts in the fields of library science and education (more fields forthcoming). Online course registration for 2019 is available: here! Note: If the class you would like to join is sold out, please email certificates@creativecommons.org to be put on a waitlist for the class. Find out more information about the Certificate, and upcoming opportunities to become a Certificate Facilitator here. Since CC is determined to make the CC Certificate available and accessible to community members of all income levels, around the world, it will be putting CC funding into a scholarship program starting in 2019. To help fund scholarships, CC will devote a portion of the standard CC Certificate ticket price to the scholarship fund. Scholarship offerings will be officially announced when they are available. Please stay in touch for more details. CC builds a decentralized Global Network. CC already has 31 formally established chapters, over 300 individual members and 42 institutional members in 68 countries. Join Global Summit in Lisbon, Portugal May 9-11 2019. In previous years, CC has provided scholarships for as many as 25% of attendees to ensure that financial means are not an opportunity cost for diversity and collaboration. Build out CC Search as a “front door” to the Commons. Think of it... 1.4 billion licensed works across 9 million different websites, like Flickr, Wikipedia, YouTube... all the way down to individual blogs. CC has indexed a quarter billion works so far, and it is just getting started!